Being a single mom on a budget I’m a frugal shopper. I do my searches online every week to get the ‘sneak peek’ for what the weekly coupons will be in the Sunday paper. I do my shopping either with peapod, who does accept coupons when they deliver your groceries, (but they are not doubled) or I go to Stop and Shop or Pathmark, which are the supermarkets that I have in my area and both stores double coupons up to $.99. I also always keep an envelope of coupons in my bag for when I’m out just in case. As a member of Fuel my blog I was lucky enough to be offered the opportunity to test the Smooth Away hair removal ‘system’ It’s essentially a lightly abrasive pad that sticks to a plastic oval with a strap so that you can slide it over your fingers and work in a circular motion and it removes hair from your arms, legs and face. I’m sure you’ve seen the commercials on TV and were skeptical.. But I’ll tell ya it does really work. My advice though is to moisturize the morning or night prior to using the smooth away as it does exfoliate, but if your skin is dry, it’s going to do more exfoliating than hair removing. I used it on my arms and it worked quite nicely. This package comes with the smooth away “mitten” as well as a smaller version to slip on your finger to smooth away the hair on your face. I wax my legs, so I didn’t use this on them, but I think this would be great for girls who want to start shaving because it does a nice job and you don’t have to worry about nicks and cuts and it is very easy to use. Plain and simple. I don’t like the taste of salt. When I was a kid I had high blood pressure and from then on I didn’t eat salt. I don’t add it much to my food when I’m cooking and it’s just not heart healthy. Not that I'm a health 'nut', but I do watch what I eat and what I feed to The Kid and The Boyfriend. 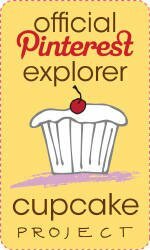 Browsing through foodgawker and tastespotting I don’t understand this new trend with salted caramel and chocolate and even cookies for crying out loud! I’m not buying into this new trend. I have my occasional (usually during that time) salt craving, but that usually means a little grind of sea salt on the hamburger or on my steak. I even brush the salt off pretzels.. Yes, even the soft ones. Yes, I know all about how it intensifies the taste of sweet things, which is why we add a bit of salt to our baked goods and chocolate anything.. But still.. I just don’t get it. A few days ago I was checking up on my bloggy things and saw a link that I didn't recognize directing people here to my blog.. so I had to investigate.. and Low and behold.. there I was a BzzAgent Frog in the Frogpond.. The Memoirs from my Kitchen BzzAgent Frog! Now, I've never been so happy in my life to be called a Frog, lol. What is a BzzAgent, exactly? I've gotten the opportunity to test and buzz some really great products thanks to BzzAgent, they're a great bunch of people over there and are always there to help you out of you have a problem. I'm a subscriber to the MomGadget daily email and when I got this morning's email I had to share it with everyone. I have an address to send donations to, so if you are interested in sending clothes for the boys or anything else to help the family out please leave a comment and I will provide you with that information. Let it be said that b5media is a close knit community of bloggers and when one is in need, the entire network seems to pull together and rally around that need. Last week, something terrible happened to one of our own bloggers, Cheril Vernon. Cheril lost her house, and her pets to a fire recently, and is without insurance to rebuild. The local Red Cross is doing what it can, but if we, the entire blogging community and social networking geeks could all show our support by giving what we can, then Cheril and her family will be doing much better than they currently are. When times are as tough as they are, the last thing anyone should experience is a loss of everything. And being the pet lover that I am, I can’t imagine losing my own in such a horrible way. Pets are like family. To read more about the incident, and send in you donation, check out the special page, b5media Blogger Loses Home in Fire, made surrounding this event on b5media’s own site. Every dollar helps, regardless of how large or small the donation. Consider it creating good karma! What you give out of the goodness of your heart is bound to come back to you many times over. Giving to such a cause made me feel as though I was truly making a difference in the life of someone who needed it. Cheril, her husband and their two boys have a terrible and long road to recovery ahead of them – we can make that journey just a tad bit easier with any contribution. Lastly, if you are on Twitter, Facebook or other such sites, please make sure to message about this, as spreading the word is also very helpful. It's been a weekend full of fun.. because Today my baby boy, The Kid is officially 13!! For the past few weeks I've been reeling.. OMG, a Teenager.. really, a teenager, my baby boy.. wow. I remember being 13.. the teenage years aren't that far behind me, after all.. but wow. Yesterday it was the annual birthday party at Dave & Busters, which I refer to as a Chuck E Cheese's for Adults, it's so much fun, we have dinner followed by not birthday cake, but Birthday Fondue (as per The Kid's request since we started going there), play games (and rack up lots of tickets that The Kid is saving up for something "really good") and leave way later than we planned. Today it was go to the movies, have ice cream and then birthday cake tonight after a home made birthday dinner. Now, since we were having this cake with ice cream as per The Kid's request I didn't make the icing.. it was just too much butter & sugar for one day, lol. I woke up feeling like total crap this morning, I was more interested in getting 10 more minutes of sleep than making coffee, my throat was so sore that the thought of swallowing anything other than medicine to numb the pain was outrageous. So on my way into the office I decided to run into Dunkin’ Donuts for a Hot Latte’ (because, honestly by then if I didn’t get some caffeine in me I would be fast asleep at my desk in no time) While I was standing on line that was practically out the door at 8:45 I saw an ad for a new breakfast sandwich, the Waffle Sandwich. 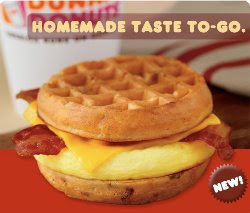 From the picture it just looked like a mini waffle with egg, cheese & bacon.. But Boy was I in for a surprise! I don’t normally get egg sandwiches from Dunkin Donuts, I used to refer to them as ‘rubber eggs’ as they were chewy and overcooked and pretty much all around nasty that no amount of ketchup and pepper could cover up. But being all I had all day yesterday to eat was a packet of wheat thins for lunch and a bowl of hot & sour soup for dinner I was absolutely starving and this honestly looked pretty good. So I went ahead and ordered the waffle sandwich and coffee and went on to my office. Now, Dunkin Donuts has some of the hottest coffee around, no matter what kind of hot drink you get you always have to wait at least 5 minutes before even attempting to take that first sip without totally scalding your tongue and throat (or at least, I do) so I set aside the bag with the sandwich and my coffee and started to tackle the pile of work on my desk that never seems to get any smaller. Once the smell of the coffee started to wear me down I took a sip (ahh, lovely) and then I opened the bag with the sandwich and to my disbelief the 2 little waffles were studded with ......little bits of Syrup! Just like the McGriddle from McDonalds!!! And not only were these little waffles good, but the egg was light and fluffy and the bacon was crispy!!! It was all around good! I like that Dunkin Donuts is spreading their wings a bit and expanding their menu options, their flatbread sandwiches leave much to be desired though, the eggs are chewy and the small portions leave you hungry. I really like this new waffle sandwich though, it’s a keeper. This is the best! Every other month I anticipate the Lemming Central Sample box.. and for almost a year now I've been absolutely Delighted every time it has arrived! Today my box arrived and I couldn't wait to tear it open! Inside the plain white USPS box encased in Styrofoam peanuts was a pretty pink paper gift bag stuffed to the tippy top with goodies and topped off with some lovely pink tissue paper..
2 candle tart samples in Hello Sweetie and Pink Sugar from What's That Smell? In the goodie bag from SBS Teas was 1 formed black tea heart, chocolate decadence soap sample, sweetheart mint roobios tea sample (with directions on how to brew the teas) and a dark chocolate truffle. It all smells really, really good! I can't wait for the April Box!!! But it sure was good! Way back when, I had this great Pillsbury cookbook that had this amazing recipe for Lemon Pudding cake.. then I rented from this horrible family who, in between picking up my things when moving here, threw that cookbook amongst many if my other things, away. I didn't think much about that book until the Meyer lemons came around and had me craving for that lemony cakey-pudding-y goodness. 2. Butter 8" square pan or baking dish. 3. In mixing bowl, combine 3/4 c of the sugar, salt and flour and stir them together. 4. Add melted butter, lemon juice and zest and egg yolks. 5. Stir until thoroughly blended. 7. In separate bowl, beat the egg whites with remaining 1/4 c sugar until stiff, but moist. 8. 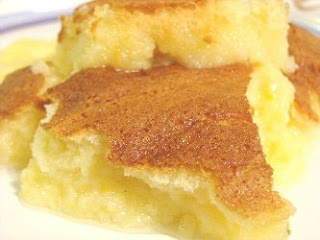 Fold beaten whites into lemon mixture, then pour batter into prepared baking dish. 9. Set the cake pan into a larger pan and pour hot water into larger pan to come halfway up the sides of the cake pan. 10. Bake for 45 minutes until top is lightly browned. 11. Serve warm or chilled, with whipped cream, if desired. Sample Boxes are on sale now! Go get yours before they are gone. Buy a box now!! Congratulations to Tickled Pink Scentsations! Their samples were voted the best Valentine's theme by our panel of judges. This sample box is sponsored by Spa Secrets, so be sure to check them out!! Hurry and get yours before they're all gone! I've been doing this since April 2008 and have never been disappointed in the items that I got. I even got 2 for Christmas and spread the goodness to my friends and family. It's a real treat for $20!